Jeremiah Aaron receives the baton from Trenton Bradley in 4x100 Meter Relay. 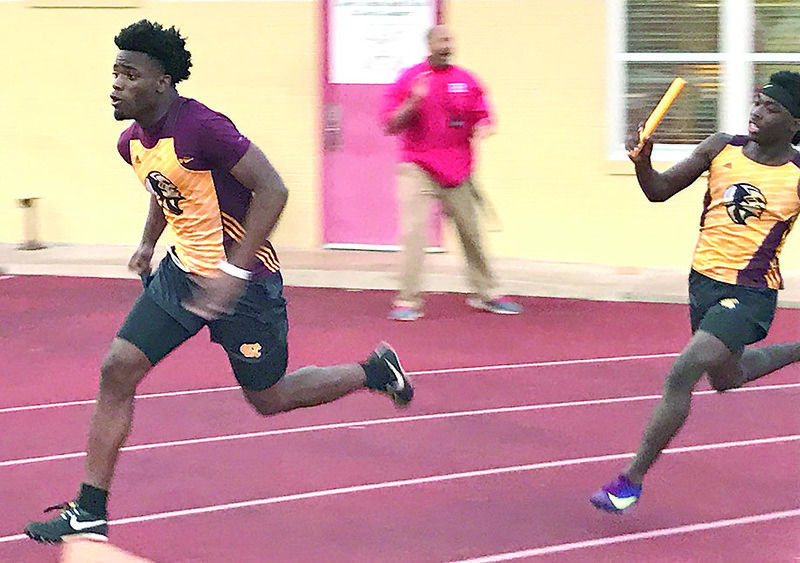 By Mark Miller The Natchitoches Central High School Track and Field teams competed in the Hoss Garrett Relays at Ruston High School March 5. It was a very competitive meet, but the teams have continued to improve as we near the District Meet April 17 at University of Louisiana in Monroe. At the Ruston meet, the boys team placed second overall and the girls placed fourth overall. The girls had great performances in the sprints, hurdles and field events. On the track, sprinter Tymmia Helaire brought home second place in the 100 meter dash with a time of 12.91 and Sidney Bayonne placed third in the 200 meter dash with a time of 27.42. …. see the full article and photos in the print edition, April 13.